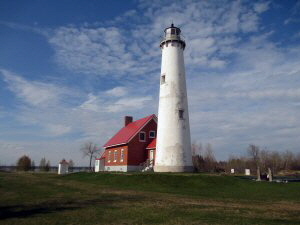 Iosco County is located along the eastern shore of Lake Huron and is predominately regarded as a tourist area. There are several auto related manufacturers, local health SERVICES: Building, Dental, Personal, Professional, Medical, Real Estate, Rental, Repair, etc. : Building, Dental, Personal, Professional, Medical, Real Estate, Rental, Repair, etc.and various mining operations that contribute to the county's economy. Approximately 60% of the county is held in public ownership (Huron National Forest and State forest lands). The Au Sable River, which has been designated as a Wild and Scenic River by the State, runs across the northern portion of the county. Several inland lakes in the county have significant resort developments. These cottages are becoming retirement homes for many resorters. North-south access is provided by US-23 to the east near the shoreline and by M-65 to the west side of the county. M-55 connects with these roads to provide east-west access. Boating resources (259 stream mileage, 36.2 Lake Huron shoreline mileage, 11 public access sites); AuSable River; Corsair, Tawas Point Lighthouse and Life Saving Station; Tawas Point State Park; numerous public fishing sites and boat ramps; and Oscoda Yacht Clubs; Whittemore and Wilbur Speedways; golf courses, parks, and dams.